Although this is the time of year that I cut back on my shopping, I cant help to add some great sale pieces to my wardrobe. With all the stores making room for their new spring merchandise (I can't wait), they are offering some great discounts on their winter items, so now is time to get those booties or that cashmere sweater that you've been wanting. We still (unfortunately) have plenty of time to wear our winter clothing before spring arrives, plus it's also a great time to stock up on basics for next fall. One of my favorite sales that is currently taking place is the Nordstrom Winter Sale. 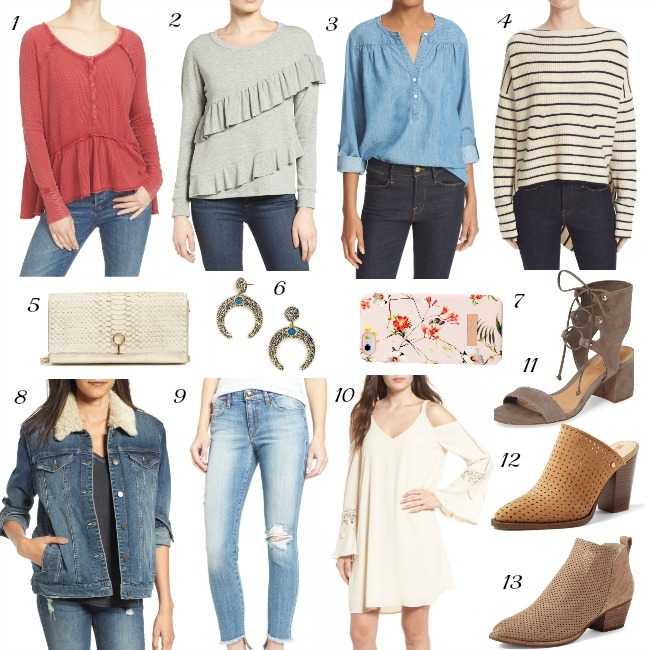 Not only do they have some great discounted winter merchandise, but they also have pieces that will take you right into spring, and I've rounded up my top picks. Ruffles and open shoulders will still have a big presence this spring, and this ruffle top is not only great to wear now, but it will look perfect with a white pair of jeans or denim skirt. Also, this cold shoulder dress is one I can see myself wearing all through the spring and summer. A good denim jacket is a spring much have, and I'm loving the shearling collar on this one. There is nothing that screams spring more than stripes, and I'm obsessing over this stripe pullover. It is still bit on the pricier side, but something I would live in all spring, and on those cool summer nights at the lake. I have my eye on all things perforated when it comes to shoes, and these booties and mules are perfect for transitioning into spring. Also, is this floral phone case not the cutest? I've had my eye on these earrings for a while, so when I saw they were on sale, I bought them right away. However, when I went back to link them, they had already sold out (just shows you how fast items are selling). They are still available on Baublebar.com, but at full price. The good news, is Baublebar is offering 15% off for first time customers. The Nordstrom sales ends February 26th, so make sure you check it out soon. If you have already shopped the sale, I'd love to hear what you got! Great picks!! Love that bag and the earrings! The perforated booties are really cute and would be a good wear now/ wear later piece. I'm also loving the ruffled sweater. Thanks for sharing, all great picks! Love season change sales! I love Nordstrom and was just looking through the sale last night. :) I ordered a couple pairs of shoes but am contemplating making additional orders. Even though I, like you, usually cut back on my shopping this time of year. Trying so hard to resist the sale, but you can never go wrong with Nordstrom!